The annual “Top Twelve Articles from 2012” was just published by Interference Technology Magazine. My article, “The HF Current Probe – Theory and Application” was the number one most read article last year! Thanks everyone! 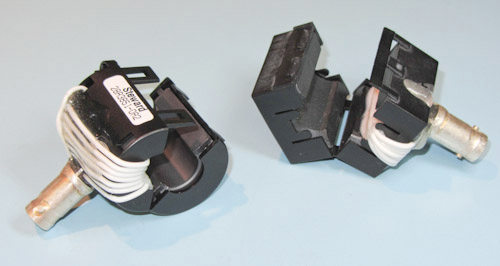 Figure 1 – A pair of DIY current probes constructed using split-core ferrite chokes. This entry was posted in Articles and tagged current probes. Bookmark the permalink. Where did you get the emc bowtie test antenna shown in your picture? Many good independent electronics stores still carry these, although they are getting harder to find now that analog “over the air” TV has been replaced with digital TV. You can also make your own with stiff wire and a small block of wood or plastic to hold the middle connections together. It’s basically a “bow tie” shaped loop dipole which yields a driven impedance of about 300 ohms. I used one of those cheap TV 300 to 75 ohms impedance transformers to provide an approximate 50 ohm match to the coax feed line.